Curent season production page for Dunellen Skylight Theatre Productions. Local community theatre under the stars in Dunellen, NJ. where the audience’s suggestions became part of the show. This one-night-only show was performed at the gazebo in Washington Memorial Park. Dunellen Skylight Theatre was proud to present our summer concert series, Skylight at Twilight! We teamed up with some amazing local bands to provide the public with four nights of music this summer. Kicking off our series on June 28th was Vintage Feedback, a rock/blues band featuring three brothers from Belvidere, NJ! On July 12th, we presented Dunellen's favorite band, Twopenny Porters, a true local band that brought folk music and original songs. To close out our series, on July 26th, we were happy to partner up with GoodWorks yet again. GoodWorks is a large and lively band that covers popular rock/soul music. All performances took place under the sky at Washington Memorial Park in Dunellen. Thank you to everyone who made our Applebee's and Houlihan's "Dine Out to Donate" events a success. You helped raise money to defer the cost of producing our shows. 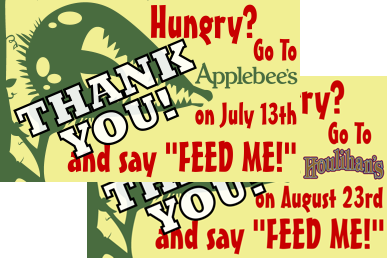 Special thanks go to the Houlihan's and Applebee's management and staff for supporting local theater. Our Broadway Bonanza was a big success. 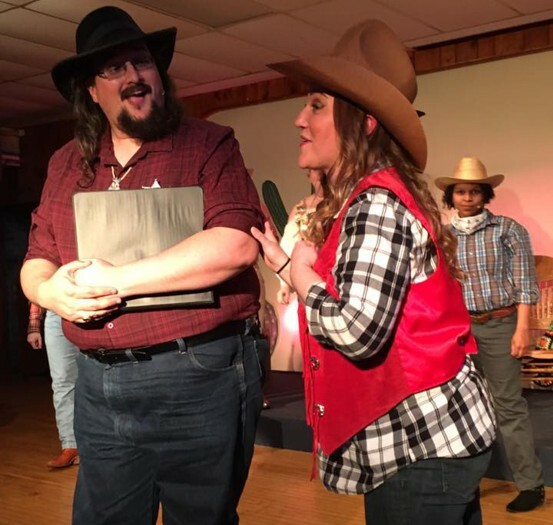 A wagon train full of singers and dancers rolled into town for a lighthearted original tale, set in the Wild West with a selection of songs from Broadway musicals. 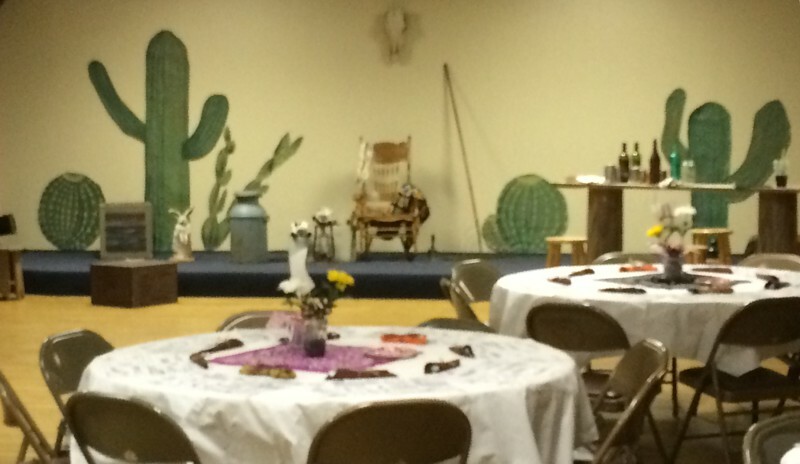 The chuck wagon style dinner buffet was enjoyed by all and the line dancing during intermission helped round out the evening. DSTP's 2017 summer musical, Little Shop of Horrors. and was performed by a troupe of DSTP's best singers. Soft drinks, coffee, tea, and desserts included. BYOB and snacks if desired. ...a fundraiser event at the Dunellen Arts Annex on Washington Avenue, on Friday, June 10th, 2016 at 7:30 pm. 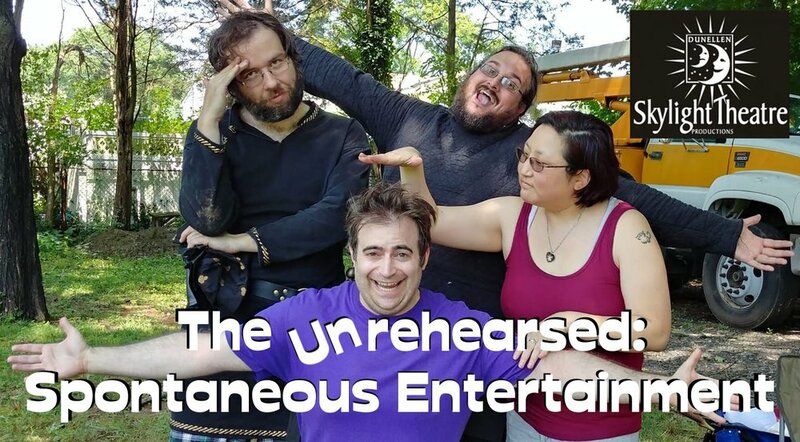 who are known to break into rousing renditions of Tony award-winning songs. Learn more about the venue and get directions here: artsannexdunellen.org. Dunellen Skylight Theatre hosted a Meet and Greet event on Friday, March 11, 2016 in the auditorium at St. John the Evangelist Church. It was a gathering for old friends and new, where people could find out who we are, what we'll be doing this year, and how they can get involved. Also featuring an "open mic" stage where they could see Skylight veterans showcase their talents and get a chance to share theirs. Our Open Mic was hosted by our own Kajoree Bhattacharya and veteran Billy Mills. Photos and video clips of some of our open mic performances are coming soon. 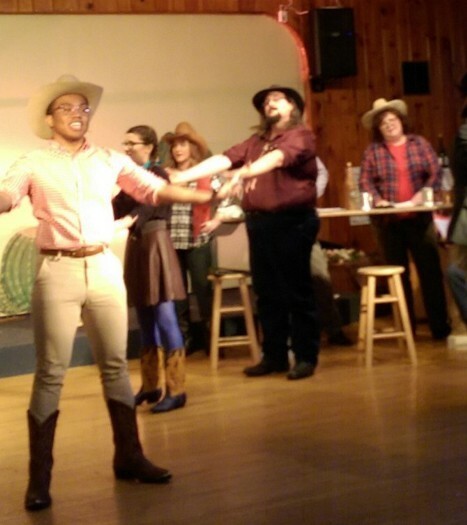 Dunellen Skylight Theatre held a fundraiser event at Zupko's Tavern on Friday, July 24th. The theme was "Summer Stock & Rock," and it featured food and drink specials, free head shots, tee shirts, and live music by GoodWorks. You can check out the band on YouTube on their channel, GoodWorksBand, or on their website, www.goodworksband.com. Learn more about the venue at www.zupkostavern.com. Dunellen Skylight Theatre Productions and the Maurer Mansion Foundation co-hosted The Taste of Dunellen, an evening for food enthusiasts to enjoy samples from some of the area's finest restaurants. Dunellen Skylight Theatre Productions hosted a special concert of piano duets in the James Heard Auditorium at Dunellen High School on Friday, February 13th. Internationally acclaimed pianists Ron Thayer and Edwin Lopez performed a variety of piano pieces by Bach, Chopin, Rachmaninoff, Debussy, Gershwin and others. Their shared love for creative concert programming led them to research and perform many neglected works for four hands. The Dunellen High School Madrigals also performed. Proceeds from ticket sales were shared between the High School music scholarship program and Dunellen Skylight Theatre Productions. Dunellen Skylight Theatre Productions, Is excited to be sponsoring: Caroling in Dunellen, Saturday, December 20th, 2014 at 6:00pm. This first time event is one which we hope will become a treasured holiday tradition. Young and old, family and friends alike, are welcome to join us in song. The more, the merrier! Carolers will meet at Washington Memorial Park in Dunellen at the gazebo. Once there, carolers will be divided into groups and assigned different areas of Dunellen. This should help spread the holiday cheer to as many homes as possible. Each caroling group will be provided a group leader, song lists and a map of their assigned area. We will also provide a sack to collect non-perishable items to donate to the FISH program. We will meet back at the Gazebo around 7:45 where we will organize the entire group to share a few last carols. Then head over to St. John's RC church for refreshments. If you plan to participate, please bring a non-perishable food along for the collection. DSTP looks forward to Caroling along with you, and helping to spread the Holiday Spirit! 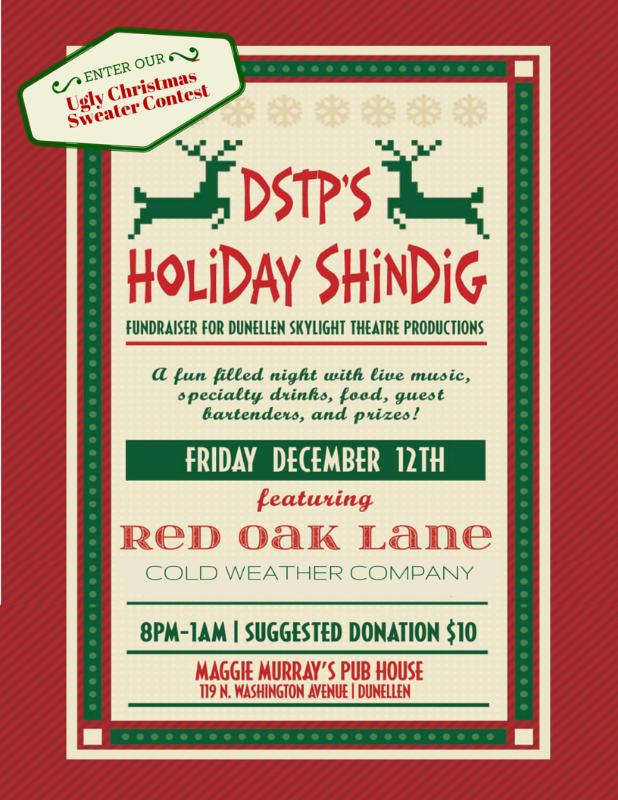 DSTP held a "Holiday ShinDig" fundraiser event on Friday, December 12th from 8 PM to 1 AM, hosted by Maggie Murray's Pub House in Dunellen, NJ. It was a fun filled night with live music by Red Oak Lane and Cold Weather Company, specialty drinks, food, guest bar tenders, prizes and an UGLY CHRISTMAS SWEATER CONTEST! Red Oak Lane is a band from the NJ/NY area consisting of Chris Yacone (vocals), Kevin Lucero (cello), Tim Le (guitar), Abel Tabares (drums) and Rich Alexander (keys/synth/backing vocals). Hailing from New Brunswick, NJ (Rutgers Territory), Red Oak Lane is set out to create unique and honest original music. Cold Weather Company is a New Jersey-based independent alternative folk band. Combining the songwriting experience of its three members: Brian Curry, Steve Shimchick, and Jeff Petescia, the band carries a diverse sound, rich with vocal harmonies and instrumental builds. Learn more about the venue: www.maggiemurrayspubhouse.com. Bubble Mania at the Dunellen HarvestFest! Dunellen Skylight Theatre participated in the 2014 Dunellen HarvestFest in Washington Memorial Park on October 12th from 10 AM to 4 PM. At their Bubble Mania booth, they were making all kinds of bubbles in all kinds of ways. The Dunellen HarvestFest is sponsored by the Dunellen Downtown Management Organization and features artists and crafters from around the Garden State, local nonprofits, activities for kids, foods, music, dancing, and more! Dunellen Skylight Theatre performers also performed a collaborative revue featuring Rutgers students and performers from Dunellen Skylight Theatre Productions performing songs from Rent, Avenue Q, Once, Aida, The Unauthorized Autobiography of Samantha Brown, A Chorus Line, and other shows. This small collaborative revue emphasized autumn as the season of "Fall-ing in Love." We held a "Christmas in July" special event fundraiser hosted by Maggie Murray's Pub House in Dunellen, NJ. July 26, 2014 from 8-12 PM, featuring presents, prizes, an ugly Hawaiian shirt contest, and live music by GoodWorks. Learn more about the venue at www.maggiemurrayspubhouse.com.